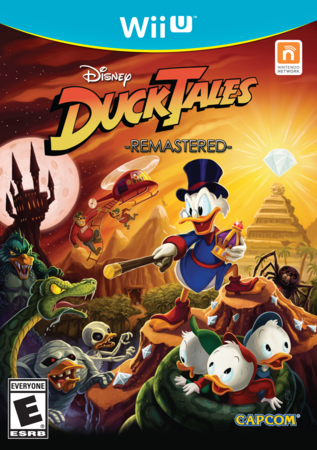 Ducktales Remastered, which has only been available until now as an eShop title, will be hitting the Wii U in physical form on November 12th, in addition to arriving on PS3 and Xbox 360. To commemorate the release, Capcom is offering an exclusive Scrooge McDuck pin to Wii U owners who pick up the game at Target. The new remastered version of the classic game contains updated graphics and a healthy amount of new content. Capcom has stated that the continued release of remastered games will depend on the level of success attained by Ducktales. Will you be purchasing a physical copy of the game? Let us know in the comments. That’s no good to us Europeans and wow a pin. Must buy now. Not. Fix the bugs and bring this game to Europe. Great game, played it all on gamepad :) but I would love to get duck tales 2 remastered as well.. Burst me bagpipes! Every self-conscious duck knows that the true value lies in the game and the experiences it provides, and everything else should be viewed as a nice, if inconsequential bonus. Ducktales is an awesome game. I’m buying it, and I don’t even know why, since I never cared for the DuckTales cartoon. And I don’t even have a Wii U.